It's been a full day of social activity--a violin recital and potluck, later a party (complete with Filipino and American karaoke)--and it's good to be back at home at last, at the computer with a cup of tea. I have misplaced The Hidden Target so I haven't been able to read it lately, although I'm sure I'll find it soon. (Don't worry, Sandie, it's rare that I really lose anything, but if it is lost I will certainly obtain another copy for you.) It's around the house somewhere, with another book I've misplaced, SeinLanguage, Jerry Seinfeld's autobiography. 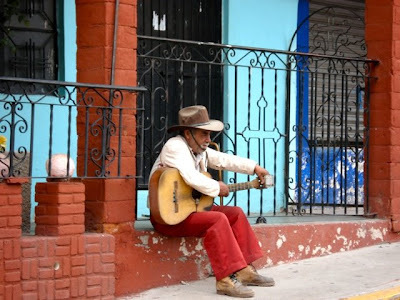 I snapped this photo in San Miguel de Allende in July of 2006. A really good book to read either before or after visiting the lovely colonial town of San Miguel is On Mexican Time: A New Life in San Miguel by Tony Cohan. 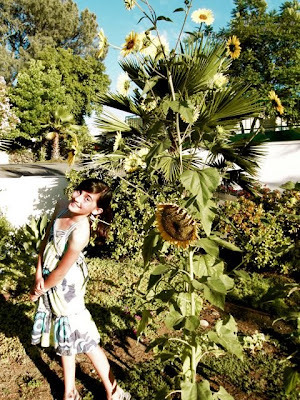 I read it after a relaxing trip to San Miguel, and it helped me to relive the experience. Today, I read it to freshen my memories. A national bestseller, published in 2000, this book is actually Cohan's memoir of his new life in San Miguel with his artist wife, Masako. They fell under the spell of San Miguel during a visit in 1985, and decided to leave smoggy, congested Los Angeles and move to a simpler, more engaging life in Mexico. Cohan paints a picture of a colorful, sensual, and lively town in this book, which celebrates San Miguel de Allende. The Art of Being Kind, by Stefan Einhorn. "Being nice has nothing to do with being spineless. In his best-selling book, Stefan Einhorn shows how kindness is the single most important factor in achieving success and satisfaction in life." Einhorn apparently makes a compelling case for kindness. Published in 2007, this book is a best-seller, sometimes out of stock (which tells me that readers value kindness). I want to read these books! Don't they sound intriguing? 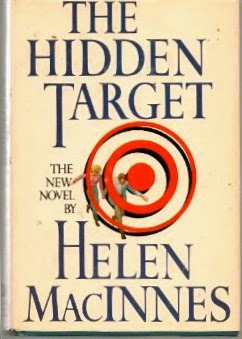 Sandie has lent me The Hidden Target, an espionage novel written by the very prolific Helen MacInnes. Published in 1980, it's the tale of a battle against international terrorism, as well as a romance between Nina and Robert. This riveting story is very different from what I normally read, but it has already drawn me in. Helen MacInnes' prose is succinct and lucid, bringing the characters and settings, both here and abroad, into sharp, life-like focus. This Scottish born author is world famous for the genre of suspense novels, having published over twenty books during a career which spanned more than forty years. Will this book sharpen my own skills as a sleuth, as I attempt to solve the puzzles and mysteries in the book and my own world? I hope so. Isn't that why we read, anyway, for clues, and to ultimately figure things out? Interested in finding more books by 'the queen of spy writers', Helen MacInnes? Visit Fantastic Fiction in the UK. Yesterday I mentioned Kindle, Amazon.com's book reading device. You can download almost any book on this lightweight wireless device in about a minute, and also get newspapers, magazines, and even blogs on it! Kindle has a built-in dictionary (for convenience during reading!) and access to Wikipedia. It's really pretty remarkable, and for people without enough storage space for all their books, it's a nice solution. I'd like to see Kindle feature color fonts and graphics in the future. Amazon.com has always been on the cutting edge. Founded by Jeff Bezos in 1994, it has become an icon of internet businesses. I remember first hearing about Amazon at a class I took about writing books for children, over a decade ago, and wondering about it (again, I was behind the times a bit). Back then, it only sold books and music, I think. Now you can get almost anything and everything on Amazon. It is huge. 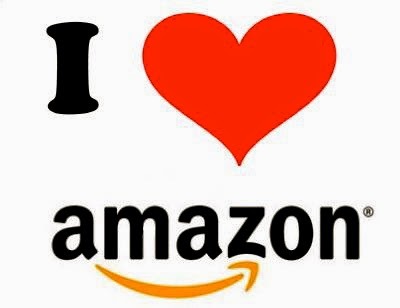 You can also sell and review products on Amazon. (I sell some books, new and used, and also write reviews for books and other products as well.) It 's a great way to express your views and perhaps help someone else make a decision about buying something. I see Amazon as the starting point of the revolution in shopping. It works because it's easy, convenient, and absolutely brilliant. Who would've thought we'd be able to shop by computer? Greetings! Today I went to the Padres game (they won after 18 innings!) and later to see friends and family at the beach, so I'm getting to my blog on the late side. It's been a lovely Memorial Day weekend so far, with a mix of clouds and sun, and weather on the cool side for May. My mother-in-law showed me her "new toy" again, a Kindle, which she absolutely loves. It's compact and light, and the words on the screen are easy to read. It would be great for travel or to throw in your purse for times when you have a few spare minutes to read. I'm finished with West from Home. (Thanks for lending it to me, Lori!) The book features some recipes that I will have to try someday. It's always fun to try recipes found in stories and books other than cookbooks. Another friend, Sandie, lent me a copy of The Hidden Target to read (thanks, Sandie!). This book will be a real departure for me. According to Sandie, it's a great way to escape. I can't wait! 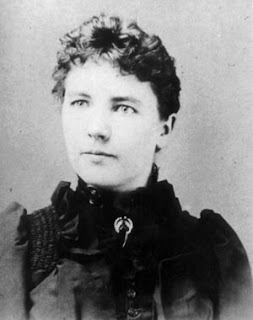 Laura Ingalls Wilder, Rose Wilder Lane, and other women have fortunately been "allowed" to be writers (and therefore a part of history as well as recorders of it), although so many women didn't have the opportunity to learn to read and write, something we take for granted today in the U.S.A.. I won't even get into the scarcity of education for women in other countries, but just say that it's atrocious. When I was in high school, I took a class called Women in Literature, and I probably should dedicate this post to my teacher, Ms. S.. She gave me a lot of encouragement regarding my ideas and writing. I was as quiet as a mouse in the class, feeling far too shy to participate. I never raised my hand. I couldn't. I was painfully shy, and must have turned crimson when called on. Once, I had to give an oral presentation, and stood in front of the class, panic stricken, sick to my stomach, knees shaking, completely enervated. It was awful! I was awful! Ms. S. told me I had "low energy" during the presentation. However, I always did well on my essays about literature by Virginia Woolf and other famous women authors. My classmates were surprised that I actually had a voice, not spoken but written, because I was so quiet. These days, I find that I can (usually) talk up a storm with just about anyone, but I still remember my shy days, and think of Ms. S., who believed in me. The Cowardly Lion in the Wizard of Oz sought courage and went to great lengths to find it. It seems to me that both Laura Ingalls Wilder and her daughter, Rose Wilder Lane, must have been born with a large amount of courage. Even though these women were not expected to do much outside of traditional work, both chose to write, and were independent, adventurous, and above all else perhaps, courageous. They wrote because it was important to them, and they also performed their more traditional roles as well as wives and mothers. 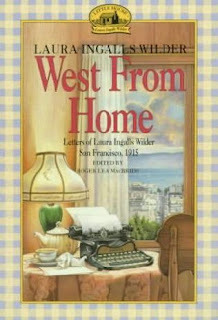 In West from Home, along with vivid descriptions of the World's Fair, San Francisco, and other sights, Laura gives her husband, Manly, precise directions about managing this and that on the farm. The farm stays in her thoughts and letters throughout her trip to San Francisco and the World's Fair. Laura does not forget her responsibility to Manly and the farm. Laura and Rose, a mother-daughter team, were "super women" of the early 1900's! Reading their letters is a joy, and foretells the achievements of the future--Laura writing the Little House books, and Rose editing them. These courageous women captured the essence of life in frontier America in nine classic volumes. They were true pioneers. "I think that by getting away from it all for awhile, and playing around with a bunch of people who are writing and drawing and otherwise being near-artists, you will get an entirely new viewpoint on things there, and be able to see a lot of new things to write when you go back." So you have Laura's daughter, also a writer, encouraging her mother to take the trip west to San Francisco in order to aid her writing career. Two points are important here, the change in scenery and experiences, and being with other creative people. This is nothing radical, but it's well expressed, and the trip did seem to ignite Laura's creativity, almost instantly, as she wrote many letters, full of detail, which are still brimming with vitality today. And, of course, Laura Ingalls Wilder wrote the Little House series of books in the years that followed her trip! "At Land's End I had my first view of the Pacific Ocean. To say it is beautiful does not express it. It is simply beyond words. The water is such a deep wonderful blue and the sound of the waves breaking on the beach and their whisper as they flow back is something to dream about." "The salt water tingled my feet and made them feel so good all the rest of the day, and just think, the same water that bathes the shores of China and Japan came clear across the ocean and bathed my feet. 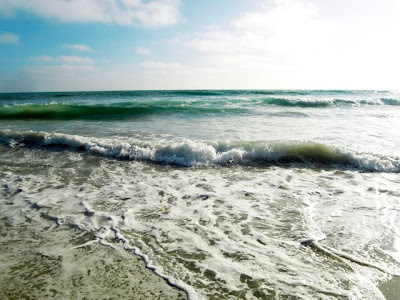 In other words, I have washed my feet in the Pacific Ocean." Laura's very impressed by San Francisco and the abundance of beauty she finds everywhere, described in West From Home. She even says it's almost too much for her! Her husband did not travel with her because the farm needed tending, but Laura shares her adventures with Manly and with us through her descriptive letters. She was a gifted writer and an incidental historian. Today I finished The Catcher in the Rye! I could then begin West from Home with a clear conscience (one book at a time). Like Holden in The Catcher in the Rye, who yearns for a more innocent world, I'm somewhat relieved to now read about a world more innocent and promising. Don't get me wrong, The Catcher in the Rye is an incredible book--it's boundless honesty is very engaging--but I'm eager for something more uplifting. I spent nearly an hour outside with West From Home, something I can't normally do during the week but today I was very lucky. It was great to sit out in the sun. Even though I had a small basal cell skin cancer removed almost two years ago, I'm no solar-phobe. I still believe that some sun is beneficial for Vitamin D production (and who knows what else). With my hat and sunglasses on I sat out in a sunny spot with my book and it was so pleasant! 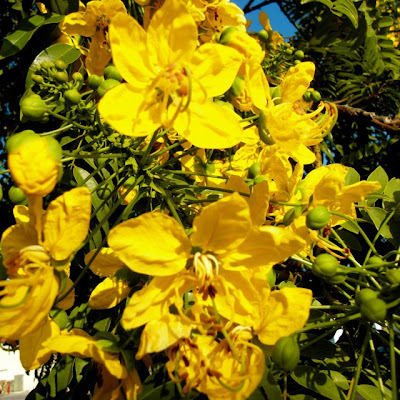 By the fragrant orange tree is my favorite place to sit, but unfortunately the bees agree with me, so I had to move away a bit. West From Home is a compilation of the letters that author Laura Ingalls Wilder wrote to her journalist daughter, Rose, and to Laura's husband, Almanzo, affectionately called, "Manly". Rose's letters to her mom, who's called "Bessie" and "Mama Bess", are also part of this collection. "It has been too long since I read The Catcher in the Rye for me to comfortably comment on it. When I am ready for another serious book I might return to that. I will tell you, though, that I have frequently read two books at one time when one of those requires a lot of deep thought (or translating into current phrases). I have been reading Dicken's Bleak House. When I am tired or under the weather, I find myself putting it down for much lighter reading. The danger is sometimes I don't go back to it soon enough and have to reread the past chapter. Books, such as West From Home, I find are enjoyable to keep in the car when I am waiting for kids since each passage is small and simple. They can easily be interrupted without losing the train of thought. I find that I am more likely to share with the kids a fun fact or quote at that time. Most of my serious reading is at night and I find I don't share that as often. I read late into the night last night so could finish my current book because I am so excited to start the Mulvaney book. (And yes, feel free to call me Lori in your blog.)" Thanks for taking the time to comment and share your thoughts, Lori! Last night I tried to finish The Catcher in the Rye but my eyes just wouldn't cooperate--I was too tired. (This is a recurring problem; by the time I'm finally able to read, I'm ready for sleep.) I'm also excited to start reading something "lighter". West From Home is next on my list. I often bring a book in my car, too, to read while I'm waiting for my kids. It's a great way to do a little reading. Truth be told, I'll be a bit relieved to finish reading The Catcher in the Rye, because it is hard to read about someone else's anguish, although it's written in a sardonic manner and the brilliance of the writer is evident. According to Wikipedia, this book has been linked to the man who assassinated John Lennon, Mark David Chapman, who was carrying the book when he was arrested after the murder, and referred to it in his statement. John Hinckley, Jr., who attempted to assassinate President Reagan in 1981, was supposedly obsessed with this book. However, the book has sold over 65 million copies, so a few crimes "linked" to it do not mean that it should be banned. It just happens to be a popular book, assigned in many in high schools and colleges as required reading and therefore read by many over the years. The censorship it received only helped to popularize it, most likely. It does not advocate drinking and smoking or other "depraved" behaviors; if anything, Holden's "downward spiral" tells us not to follow his path. J.D. Salinger expresses adolescent anguish in the The Catcher in the Rye through his protagonist, Holden, who is very critical of everything and everyone, and also aware of his own inconsistencies and shortcomings. He's a wanderer without much direction, literally and figuratively, having "flunked out" of prep school; he doesn't go home but stays in a hotel and wanders around the streets of NY. It's a period in life full of questioning and doubt and aimlessness, but also great flexibility and possibility. Holden disapproves of everything he considers to be "corny" (kids today say "lame") and as I mentioned before, he can't stand phonies and phoniness--anything "just for show"--movies and actors included. (I wonder if this is when people in general are at their most discerning in certain ways? I remember having similar highly critical feelings and attitudes when I was the same age.) I think Holden's quest in the book is for something real and true and lasting--so many of his own feelings are fleeting. I do not envy him at this stage in his life. I am well into The Catcher in the Rye. I'm getting to know Holden Caulfield fairly well, as he expresses his innermost thoughts, including his dislike of many people, although he adores his younger sister, Phoebe, who is ten years old. About her he says, "You never saw a little kid so pretty and smart in your whole life. She's really smart. I mean she's had all A's ever since she's started school. As a matter of fact, I'm the only one who's dumb in the whole family." He also thinks she's a wonderful dancer. His affection for his sister is touching. Although Holden is a self-proclaimed liar, his thoughts are true and honest, and his feelings are real and complex. This novel is an attempt to present the unfiltered, uncensored thoughts of a young man. (There is some crude language and profanity in the book, which led to having it censored in high schools initially. After that, and maybe because of that, everyone wanted to read it.) As a female, it's interesting to be "inside" of a male brain. Very interesting. "I'm the most terrific liar you ever saw in your life. It's awful. If I'm on my way to the store to buy a magazine, even, and somebody asks me where I'm going, I'm liable to say I'm going to the opera. It's terrible. So when I told Spencer I had to go to the gym to get my equipment and stuff, that was a sheer lie." Presently, I can only manage to read a chapter or two of The Catcher in the Rye a night, although I'd like to read more of it per sitting. Now the pressure is on! Today I was loaned two other books by a good friend, Lori, West From Home by Laura Ingalls Wilder, and Bloomability by Sharon Creech for my daughters (and myself). I usually read one book at a time, although sometimes I'll read an adult book and a book for children at the same time. Is there a "rule" about this? Do you think it's better to finish one book before starting another? I'm very interested in your thoughts. Perhaps I should conduct a new poll! I feel as if I'm back in English class writing essays! I wonder, have I forgotten how to write properly? I'm now constantly looking things up and finding the need to edit posts. Luckily, you can edit published posts quite easily! I'm using more exclamation points in my writing. I noticed recently that Joyce Carol Oates uses them frequently in her novel, We Were the Mulvaneys, to convey depth of feeling. We all do this in emails, using multiple exclamation points even, but it struck me as new and original in Oates' book. I like it! Isn't that what life's all about, anyway? Feeling, enthusiasm, lust for life, passion! Last night I finished Michael J. Fox's autobiography, Lucky Man. It is well written, a funny and poignant account of his life. I knew next to nothing about Parkinson's disease, "PD", before reading this book. Fox discusses the beginning of his symptoms, a pinkie that suddenly, out of the blue, wouldn't stop twitching, then the gradual but obvious progression of the disease, and how Parkinson's affected and changed him. He has become a spokesman for Parkinson's, and started his own foundation eight years ago, The Michael J. Fox Foundation for Parkinson's Research, whose mission is to "find a cure for Parkinson's disease within the decade. . .", which has already funded over $120 million in research! Sometimes I find it difficult to name a new post. If my kids were to name my post, they'd probably want to call it, "Mom's Random Thoughts About Books". They LOVE the word random, and use it often. (Why do they love this word? I suppose you can label almost anything as random, and get a laugh.) While my ideas may sometimes seem to be out of the blue, they are actually related to what I'm reading and thinking about. I may be able to start The Catcher in the Rye sooner than I thought, due to a schedule change. Interestingly, author J.D. Salinger dedicates this book to his mother! My blog will elicit many yawns, unless you really love reading and books. Then you'll understand, you' ll "get it". If you 're a book nerd like me, if you feel there's nothing better than to read a book, then we share this passion; I hope you' ll subscribe to this blog, or at least "visit" often. Today I went to the bookstore (my candy store) and found a great little reading light which clips onto your book for help with night reading. I can't wait to try it! I also bought a book for a friend, and a classic book for myself, The Catcher in the Rye by J.D. Salinger. I read it in high school and intend to read it again, as soon as I finish a couple of other books. "Until that moment, I'd never considered writing. Granted, I read all the time, but actually sitting down and coming up with a story on my own? The very notion was ridiculous. I knew nothing about the craft, I had no burning desire to see my words in print. I' d never taken a class in creative writing, had never written for the yearbook or school newspaper, nor did I suspect I had some sort of hidden talent when it came to composing prose. Yet, despite all those things, the notion was somehow appealing. . ."
It's a good thing Sparks took her advice! How many best-sellers has he written? My own mom is also a source of encouragement. She has ambitions for me! No matter what I attempt, she's my greatest supporter. Her infectious, unquenchable optimism helps me to see the glass as half full nearly all of the time. As always, I welcome and thank you for your comments. "My mom's attitude made it hard not to like her. She was always upbeat, no matter how terrible things were, and she made light of things that most people would have found unbearable. For instance, my mom worked (as many mothers did), but she had to ride a bike to work. Whether it was pouring rain or 105 degrees, my mom would dress for work, hop on the bike, and start pedaling the four miles to the office. Her bike had a basket on the handlebars and two more behind the seat; after work, she's ride the bike to the grocery store, load in whatever she needed, then ride home. And always--I mean always--she beamed when she walked in the door. No matter how hard the day had been, no matter how hot or wet she was, she made it seem as if she were the lucky one and that her life couldn't get any better." This passage by Nicholas Sparks could describe my own mother, who was also unfailingly cheerful after a hard day's work. While she rode buses and the subway to work rather than a bicycle, she was energetic and uncomplaining every day. She walked to the supermarket and lugged home bags of groceries after work up the steep hill to our apartment. My mother, who raised four daughters, seemed to thrive on hard work! In honor of Mother's Day, posts this weekend will be devoted to mothers and motherhood. By 1914, Anna Jarvis, the Founder of Mother's Day, answered the prayer of her own mother ("I hope that someone, sometime will found a memorial mothers day commemorating her for the matchless service she renders to humanity in every field of life. She is entitled to it.") and established Mother's Day to "honor mothers, living and dead...."
Harriet Tubman was an African American born into slavery; in spite of physical handicap and lack of education, she dedicated her life to gain freedom and save the lives of millions of people like her. Mother Teresa, who worked on behalf of India's poor, lepers, and the downtrodden for decades. Perhaps the most famous "mother" is Mother Earth. The notion of Mother Earth arose centuries ago in ancient Greece. A nice gift idea for yourself or your mother, delivered with a bouquet of fresh flowers, might be a book you or your mother want to read, or a journal to record thoughts in, and then somehow arranging the time to actually read or write! Celebrate and enjoy!! What Mother's Day traditions are a part of your life? Learning what people really think and feel, underneath the social masks we all wear, holds a great deal of appeal to me as I read. In life, we relate to our families, friends, co-workers, and others, but how often do we really know what they are truly feeling and thinking? What their motivations are? Children are generally more straightforward and honest, "easier to read", because they have not yet learned to rein in emotions and impulses. Adults, on the other hand, are very good at disguising themselves in an attempt to fit in and get along with others. (I spend ample time trying to figure other people out, don't you?) Needless to say, we often hide our true feelings. This can be a necessary and kind thing to do-- I am not opposed to this. But in terms of truth and honesty, there's a lot more of it found in "fiction", as well as some biographies and autobiographies, where characters expose themselves--their thoughts and emotions--to the reader. The reader is privileged in this regard. Today is the one-week anniversary of this blog! I'm always trying to improve this blog, and sincerely appreciate all comments. In this age of "instant gratification", where nearly everything is available by the click of a mouse--information, goods, new acquaintances, and much more--it feels almost "old-fashioned" to sit down, to slow down, and read a book. You can research practically anything from the comfort of your own home, at the computer. No need to venture out to the library anymore! It's right at your fingertips, just point and click, and there's a wealth of information and options. It's remarkable and yet, is this making us all a bit impatient in life? Yesterday I was thinking about that quite a bit. I had driven to the gas station (VONS Gas) to fuel up my gas-guzzling SUV (which costs me well over $50 per visit these days) and I started to get upset when I saw the long, winding lines at the pumps. Normally I'd be muttering under my breath. This time, though, I took a deep breath and thought, take a different approach. Embrace (for lack of a better word) this. Maybe it will help me become patient again. I exhaled, and ate a few pretzels that I had in my car (delicious sourdough Bavarian pretzels). I channel surfed and found a great song on the radio by Dave Matthews called, I think, "Everyday", which nearly always chokes me up. It was a pleasant interlude in my otherwise hectic day (even though I live in "laid-back" Southern California, my life is anything but). The driver in front of me then signaled that I could go in front of him to a now available pump. I declined and decided to wait. How nice to wait for something! There are thousands of blogs about books out there. Thousands! I wanted to call this blog "a blog about books" but the NY Times already uses that logo for their blog about books, Paper Cuts. (I guess I am way behind as far as blogging goes. I admit to being a complete novice--so there's hope that this site will improve as time goes on!) What's the secret to being "original" with words? Is there a way to think up new things, or to present old things in a new light? Has everything already been said? I don't think so. There are many ways of expressing things and many things that may be expressed in a new way (sometimes in a bold way, sometimes in a subtle manner, or somewhere in between). Does that last sentence really confuse you? Is that sentence a result of my tea intake? 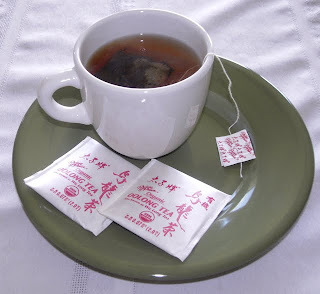 In order to help me write somewhat original posts, I rely on tea. Three cups of tea over the course of the morning help me to put my thoughts about books and reading into written form. At the very least, I hope I'll be clever enough to win your attention for awhile! As I have mentioned, I began reading Michael J. Fox's autobiography, Lucky Man. In the book, he is candid and articulate about his life. The title, Lucky Man, says a lot about his attitude and approach to life. Like Lance Armstrong, who battled widespread cancer, Fox sees his disease, Parkinson's, as a gift rather than an awful burden, at least at the time of writing this book, 2002. He doesn't complain about it but sees how it has changed his life for the better. I'm not trying to sell this book to you, but Fox has many interesting and inspirational things to say. Here' s something I want to remember from the book: in a humorous manner, he talks about actors going over scripts and how they only focus in on the size and importance of their own parts. Isn't this so true of us all in a larger context? His honesty draws me in; I also am learning about his world of auditions and acting and his life in general. When I start a new book, it's like making a new friend. At first I feel kind of tentative and don't know what to expect. Will I even like this particular book? Is it worth reading? Sometimes I decide it isn't, and don't finish it, or even get very far before stopping and returning the book to the shelf. Other times, I'm rewarded by a wonderful and new experience as I continue to read. As with a new friend, I seek common ground: do I feel the same way as the author? Do I see things the same way? Or is this writer so unlike me that I find him or her interesting for that very reason (and wish to continue the relationship)? It is exciting to start a new book, although I also feel a bit of sadness to be finished with the old one at the same time. Sometimes, I may not really feel like starting another book right away, but want to think about, linger, languish, for awhile longer before moving on. Because reading a book at a certain time in my life also marks time in a unique way. The books I read today are the memories of tomorrow. Of course, the beautiful part is that I can always read them again. I just started Michael J. Fox's autobiography, Lucky Man. I have not read much of it yet--just a few pages I've managed to squeeze in to my schedule--but hope that it will win my attention like a promising new friend. So far, so good. Happy Cinco de Mayo! May is one of my favorite months, although it can get awfully warm here. Today's cool and cloudy though, with a chance of rain tonight (and we definitely need the rain). Days like this are perfect for sitting indoors with a book and a steaming cup of oolong tea. 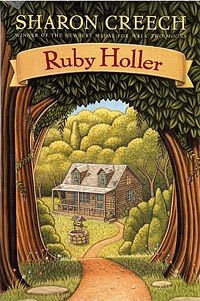 I just finished reading Ruby Holler, Sharon Creech's Carnegie Medal winner. What a magical book for children and adults alike! Humor and inspiration go hand in hand in this saga of Dallas and Florida, orphan twins. The twins show a great deal of imagination, and the author, Sharon Creech, who has written several books for children, also has a thriving imagination. Once again, I am refreshed by the power and beauty of imagination. There is not a dull page in this book! As always, I welcome your feedback! Can anyone suggest a good title for this post? I thought "Imagination" might be good but am open to better ideas. (Thanks, Lori!!) Please take the poll at the end of the page (if you can choose)! As a child, I remember going through a long stage where I devoured biographies (and autobiographies). Books devoted to Helen Keller, George Washington Carver, Abraham Lincoln, and Vincent Van Gogh engaged me. It probably started in fourth grade or so, when we studied biographies of famous leaders in history. From an early age, people fascinated me, especially those who rose above obstacles and made something of themselves. To this day, I enjoy reading biographies (as well as autobiographies) for the same reasons. Recently, that is within the past couple of years, I've read a few biographies of more current people, such as The Autobiography of Malcolm X (utterly fascinating and enlightening), Lance Armstrong's Autobiography, It's Not About the Bike (inspiring on many levels), as well as Portrait of an Artist, about Georgia O'Keeffe. I found Elizabeth Wurtzel's memoir, Prozac Nation, too depressing to read in its entirety (her writing about how miserable she feels just brings down your own mood after awhile although she is, I'm sure, extremely bright). I am a huge fan of Nicholas Sparks, and recently read Three Weeks With My Brother, which is more or less autobiographical. In this book, you see that Sparks' fiction stems from events in his actual life, which add a new dimension to his novels. Soon I will probably start reading, Lucky Man, Michael J. Fox's autobiography. I have the book on my shelf and it seems like it will be a good one. "I love biographies and the books I bought for the trip were: Wonderful Tonight, by Pattie Boyd; The Rivals, about the rivalry/friendship of tennis legends Chris Evert and Martina Navratilova; Obama, by a Chicago Tribune reporter who's covered the Senator for years; and finally, Chasing the Dream, by Joe Torre. In retrospect, I noticed that all these touch upon a period in American culture I'm especially interested in, the 1960s. So...on the flight out, I started with Boyd's book. For those who may be unaware, she's the ex-wife of George Harrison; she left him for Eric Clapton (Clapton immortalized her--or at least his longing for her-- in his song "Layla"). I thought I'd get a look at the repressive 50s, the swingin' 60s, and beyond, and I did--but this book was so poorly written I stopped about halfway. I don't care how much she considers herself a mover and shaker in the cultural revolution that was going on back then, it's pretty apparent from the start that Boyd is not a contributor (or even a thoughtful observer) but essentially a glorified hanger-on. Kind of sad, but I guess that's how women saw themselves, as appendages to powerful men. Perhaps if the book were better written with some attempt at analysis it would have held more interest for me, but it was just the same thing over and over again ("We flirted...We felt a powerful connection...We got high..." etc., etc.) One day I'll pick this up again to see how it all turns out (I'm sure she discusses George's last days and Eric's addictions). Next was The Rivals--no, not the Sheridan farce, but, as mentioned, an examination of the Chris Evert-Martina Navratilova tennis rivalry and friendship. I remember first reading about Chris Evert in Sports Illustrated back in 1971 and thinking how cool and collected she looked. She got me--and others-- interested in tennis (as a spectator sport) and I followed the major tournaments on TV for a few years. Other than her autobiography (which I'd read about 15 years ago) I didn't know much about her and this book did a good job in filling in the gaps. I knew less than nothing about Martina and this book opened my eyes to her really independent spirit and courage--defecting from Czechoslovakia, her openness about her sexuality, etc. Remember, she basically came out in the 80s, when it was not acceptable or fashionable to do so. But this book is so much more than a biography of simply these two; among other things, it paints a detailed picture of the history of women's pro tennis and the struggles involved in achieving parity with the men's tour. A fascinating social document. The book is by Johnette Howard and is highly recommended. I could not put this book down. . . . "
Sharon, thank you for taking the time to put your thoughts into writing. They are certainly "post worthy". Greetings! Lest you think I'm some kind of simpleton, I read books other than those written for children. (Although I did just read Little House on the Prairie, by Laura Ingalls Wilder, and LOVED it, especially the descriptions of how Pa built that snug little house.) So what else will I talk about in my blog? It will probably evolve into something naturally as time goes on--I'm not sure what-- but I want to keep writing and recording my thoughts. One thing's for sure, while I may talk about certain books, I' ll never tell you which books to read; I dislike it when people tell me to read a certain book, even if it IS a good one. I don't usually read bestsellers when they are "hot". I prefer to make my own choices, and NOT choose what's being hyped at the moment. So, I resist, I rebel, in my own quiet way. I browse the book stores, the "real" ones and the virtual ones, and venture to the library. I skim book reviews, to learn about new books, and for clues and insights to aid my choices. I take my time choosing what I 'll read. More often than not, I'm surprised at how much I end up enjoying a particular book I chose to read. I am new to this and hope you'll find my blog interesting. If you are like me, books, with their stories and ideas, draw you in like nothing else. If so, keep reading! One of my favorite things to do is to host "Reading Bed" in the evening for my young daughters. We find the books we are each (separately) reading, get under the covers of my CA King sized bed, and READ. Our cat, Sara, is usually sleeping somewhere on the bed, and our dog, Jenny, on the rug nearby, adding to the coziness of it all. Together, we then each get lost in our own worlds. Sheer bliss! Greetings moms, dads, and teachers (and those young-at-heart)! Do you ever read the books your kids read? I imagine that teachers do read the books that they recommend to their students, or have read them in the past, but parents, do you read them (after your kids are old enough to read to themselves)? Some of these books are truly wonderful. I am currently reading a book that my ten-year old daughter recently finished, Ruby Holler by Sharon Creech, a thoroughly enjoyable story (so far) of twin orphans, Dallas and Florida, who cannot seem to get adopted, or find a permanent home. That is, until they live with Tiller and Sairy, a quirky but loving older couple who live in the woods of Ruby Holler. I also read Walk Two Moons by Sharon Creech. As a literature (and art) major in college, I never imagined myself reading children's books and enjoying them so much.